Being stuck at the kid's table never looked so good! 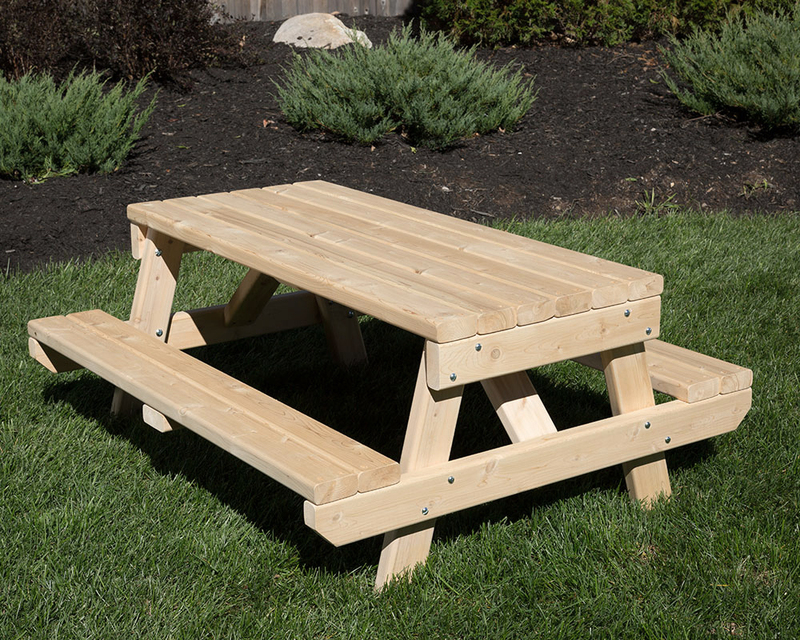 Triumph's kid's picnic table is great for outdoor lunches, crafts, or even high tea. This cedar table is built extra sturdy to ensure years of play and imagination. Allow 3 to 4 weeks for delivery. Price does not include shipping or installation. Table Top Dimensions: 47" x 21"
Triumph Play Systems, Inc. will warranty all, slides, swing hangers, swing belts, chains, metal brackets and accessories for a period of TWO YEARS from date of purchase by ORIGINAL PURCHASER against any defects in material or workmanship. Triumph Play Systems, Inc. will also warranty all wooden components, bolts and screws for a period of no more than TWO YEARS from date of purchase by ORIGINAL PURCHASER against structural failure. Seasonal cracks, checks, graying, color distortion and knots are natural characteristics of all wood and are not covered under this warranty. All warranty issues will be reviewed and decided upon, at our discretion, as to the proper course of action. Any third-party alterations or additions, negligence, vandalism or abuse, acts of God or improper use will void this warranty. All shipping costs and installation of replacement items are the responsibility of customer. Triumph Play Systems, Inc. works continuously to improve our play set designs and reserves the right to change designs and/or components without notice. This warranty is subject to proper installation and normal residential use. It is nontransferable and applies to ORIGINAL INSTALLATION AND PURCHASER only. We are not responsible for accidents that occur during the use of our play systems. PLEASE SUPERVISE ALL PLAY ACTIVITY. Each Swing Set is made to order in our factory. We make every effort to ship your order in 2 to 3 weeks. Orders most be paid in full before we can ship your order. The purchased Playground Equipment will be shipped via Common Carrier aka “Freight Carrier”. The Freight Carrier will not be responsible for an exact delivery time or the unloading of items. It is advised that two able-bodied people (capable of lifting 50 pounds or more each) be present at the time of delivery due to the size and weight of some items. Noticeable damage incurred during shipping, if any, should be noted on the shipping invoice at the time of delivery. If, for any reason, purchaser refuses shipment, return freight cost will be the responsibility of the purchaser. Returned items will be credited to purchaser, less all freight charges, and a 20% restocking fee. Please follow the instructions below when packing and sending your product for return. It's important to note that the instructions must be followed in order to allow us the opportunity to process your return. Please send the item in its original packaging if possible and pack the item carefully so that it will not be damaged during the shipping process. Include a copy of the packing slip. Use a secure shipping method to send the item so that it can be tracked. For example, if you are sending it through the United States Postal Service, please send it with delivery confirmation. We are not responsible for items lost during shipping, and cannot process your return until the item is received. All returns should be sent to the following address: Triumph Play Systems, 15 Maple Ave, Ashburnham, MA, 01430.